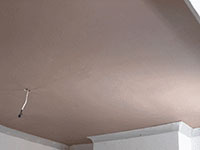 The Tooting plasterer was asked to replace a damaged plaster & lath lounge ceiling in SW17. The ceiling was plasterboarded, ensuring that the boards were securely attached to the beams. Scrim tape was applied to all the board edges to prevent ceiling cracking. Our professional plasterer fitted new coving. Finally the ceiling was skimmed with a smooth 2 coat plaster finish. The even polished surface was then ready for painting once dry completing a total transformation.